OPENING: (From sixth left) Georgina, Wong and Philip Baginda among those cutting the ribbon to launch the sports day. 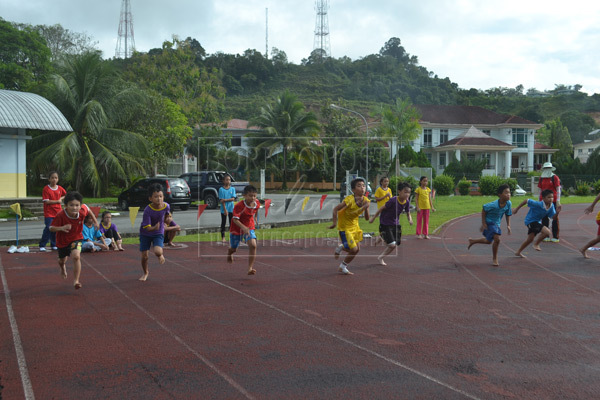 DETERMINED TO WIN: The 100m relay for boys under 12 years old. KAPIT: SJK(C) Hock Lam held its annual sports day at Padang Sukan on Tuesday morning. The two-day event from last Monday to yesterday saw some 500 pupils of the school compete in 63 field and track events. They were divided into four sporting houses – Red, Yellow, Blue and Purple. Officer in charge of co-curricular activities at Kapit Combined Education Office, Philip Baginda at the opening ceremony said the Education Ministry had stressed the importance of sports and the goal of ‘1 student 1 game’. “Sports provide holistic education to achieve spiritual, emotional and physical balance. A healthy and fit student is able to concentrate and do better in studies,” he said. Philip recalled that in the old days many pupils had competed in aquatic games and swimming up to national level. He believed to regain their former glory, the school needs to train athletes to compete with those from other schools at district level. Headmaster Wong Siew Ching, officiating at the opening ceremony, praised the school board of management, Parent-Teacher Association and school for cooperating to make the sports day a success. Wong disclosed that Tai San Ten Association sponsored the refreshments for the pupils in the sports held over two days. He said SJK (C) Hock Lam is the only Chinese-aided primary school in Kapit with 646 pupils and over 40 teachers. “I thank you teachers for organising extra classes for Primary 6 pupils in the afternoon as well as a motivation camp to prepare the 96 pupils to be familiar with the exam papers,” Wong said. PTA chairlady Georgina Pui said sports day reflected the spirit of teamwork and cooperation that has to be nurtured among the young. She congratulated school teachers for their dedication and commitment in organising the annual event. Among the guests at the opening ceremony were the school’s board of management deputy chairman Kapitan Yong Thu Fook, secretary Chong Shin Kin, treasurer Dato Yong Hua Sying and PTA vice-chairman Ting King Yiing.